ARTA, Djibouti -- March 25, 2006 -- U.S. Navy Construction Mechanic 1st Class David Borkowski, left foreground, works with Djiboutian Army Sgt. Farah Hassan Boueh to test the resistance in an ignition relay wire. 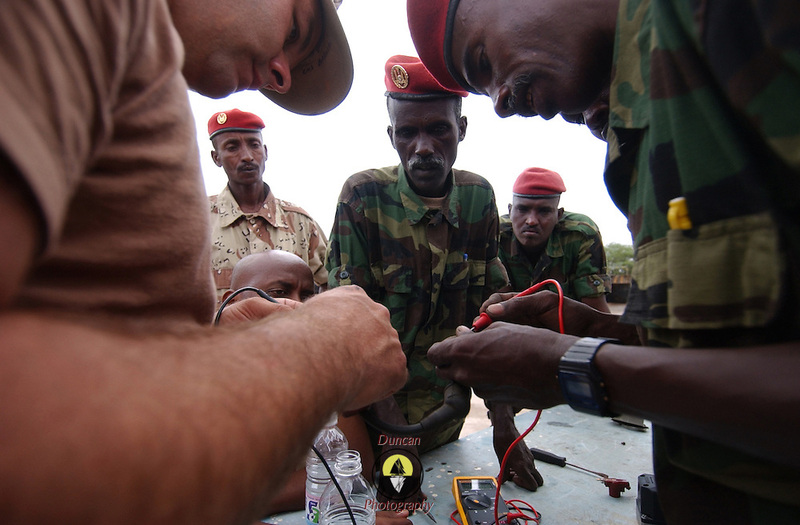 Borkowski, Leading Petty Officer of the Naval Mobile Construction Battalion 7's Engine Repair Department at Camp Lemonier, is teaching a two-week class on auto maintenance skills to the Djiboutian military at their camp in Arta. .Borkowski said, "We're having to pull out every part, trouble check it and put it back in. This process assures us that the problems we're seeing are not the result of bad parts. It also has the added effect of teaching these guys how the whole engine goes together."